Howdy, folks! Sorry I’ve been off the air for a bit. Busy November. 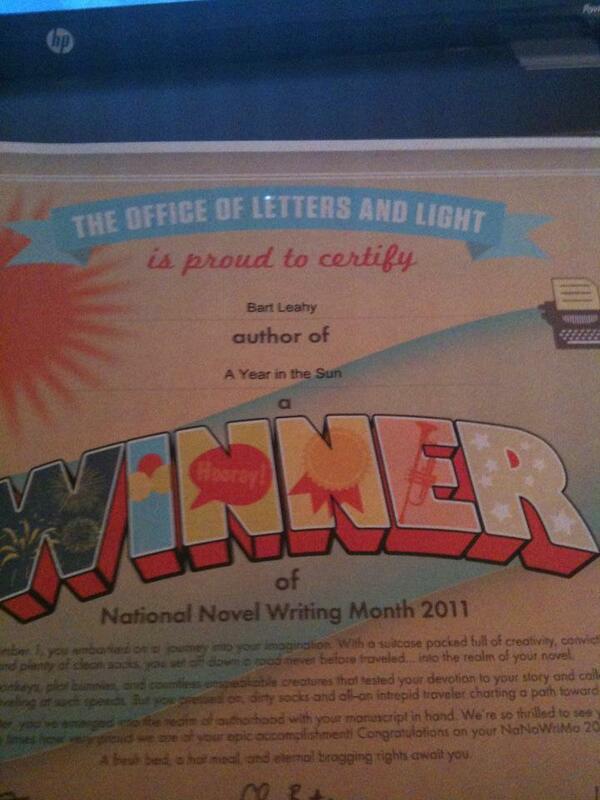 I managed to kick out a 59,770-word first draft of my first original novel as part of National Novel Writing Month. If you’ve had an idea in your head for years and were looking for an excuse to get something down on paper or into electronic form, the NaNoWriMo page provides the help you need. Of course now, having written the first draft, I have to go back, reread it, edit it, and then pass it on to some friends I trust for more editing before sending it off to a publisher. I have a steep learning curve ahead. In addition to fiction writing, I was assembling paperwork evidence to submit to the Guinness Book of World Records for the World’s Largest Cheerleading Cheer. You can find my story here, Darlene the Science Cheerleader’s entry here. And for those of you wondering, yes I am capable of actual relaxation. However, as it happens, my primary non-day-job activities or hobbies also employ my brain. I plan on engaging in a bit of sloth in the not-too-distant future, but as it stands, I manage to keep myself pretty busy during my “free” time. You might ask: what, exactly, does an out-of-shape, 42-year-old tech writer do for the Science Cheerleaders? A little bit of everything, actually. Darlene Cavalier, the former ’76ers cheerleader who started the whole thing in the first place, is the creative genius behind the content. For the past two or three years, I’ve been the logistics guy or operations manager, or “Cheer Operations Ninja,” to use my more fun title. I work on a lot of the behind-the-scenes stuff when the Science Cheerleaders appear at events, from putting together show schedules to tracking flight times, uniforms, and boots. Occasionally I’ll suggest ideas to Darlene about content, media outlets, event formats, or even locations. Example: “Ya know, if we want to set a world record for number of cheerleaders, Pop Warner has a competition at Walt Disney World every year.” At which point Darlene jumps into action contacting Pop Warner, and she starts the process for bringing the SciCheers to their event. As it turned out, there would be more cheerleaders at a Pop Warner competition in New Jersey, so that’s where we went for the record. But any way you look at things, this is the cheerleaders’ show. I’m the backstage guy, which fits my skills and temperament well. I keep the little stuff organized while Darlene goes out there and leads the charge. I won’t deny it–working for the Science Cheerleaders is a hoot. However, a big part of why I help is because I believe in what Darlene is trying to do: make science-related communication fun, increase science literacy, improve female participation in the sciences, and ultimately expand citizen involvement in science- and technology-related debates. And yes, this type of work helps build up the portfolio/resume. So much the better. This entry was posted in education, marketing, personal and tagged Guinness Book of World Records, hobbies, NaNoWriMo, National Novel Writing Month, organization, Science Cheerleader, World's Largest Cheerleading Cheer. Bookmark the permalink. Wouldn’t be the same without you, Bart. Thank you for all you do. What you didn’t say here is that every SciCheer who’s had the pleasure of meeting you (in person, online, or on the phone) LOVES you. We’re very, very fortunate to have you on our team. This nomination process is from fellow bloggers who are supporting blogs of fewer than 200 followers.